Children will love it, if you serve with an addition of salad cream or mayonnaise. It creates kind of refreshing bites together with the soft and moist shrimp paste in the palate. But for me, as a regular diet-watcher, no cream, of course, I sprinkled a touch of Italian herbs and coarsely grounded black pepper when served. 16 squares were made within an hour, from handling the prawn till ready to serve. Yes, quick and delicious homemade snackies, and even as breakfast, like I did this morning. 1) As stated, trim crust of all sides, and cut each trimmed slice into quarters to make 16 squares altogether. Set aside. 2) Chop shelled and deveined shrimps into paste-like consistency (*If you prefer fuller bites, coarsely mince the shrimps will do). Add seasoning as listed, mix well. 3) Now, take 1 bread square and place it on your palm, spread some shrimp paste on top of the square covering the whole surface. Repeat step till all bread squares are done. 4) Beat the eggs, and season with ½ teaspoon of light soy sauce and pepper. Beat well to combine. Then, lightly coat each bread square with the beaten egg before placing into heated pan. Repeat step till all remaining done. 5) At the same time, heat large frying pan with 1 tablespoon of oil over medium-low fire. Once heated, place bread squares into the pan to sauté both sides till shrimp paste is lightly pinked and breads turn light browned, about 30 seconds each side but time varies depending on the density of the ingredients used. Drizzle oil during the sautéing process till all breads are done. Then, transfer golden bread squares onto a lightly greased baking tray, and place baking tray at middle rack in the oven to toast on 170°C, for 3 – 4 minutes (*Keep an eye on the process occasionally to avoid over-toasting). When done, arrange shrimp on a nice serving dish. Garnish or/ and serve with dipping cream, if desired. Serve warm. 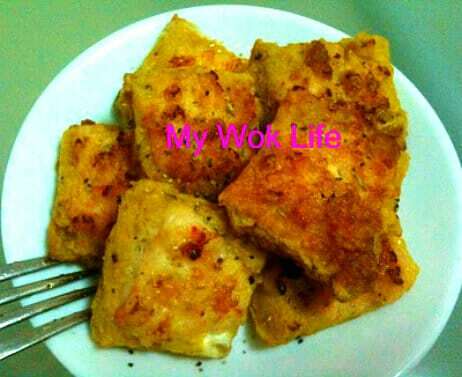 Each bread square of my shrimp toast with regular wheat bread used counts about 70kcal. This based on my listed cooking method. Calorie amount varies based on the density of ingredients and alternate cooking methods. Toasting the bread after sautéed it is not compulsory, but I did it to extract the excessive oil absorbed in the bread while sautéing, at the same time, to make it more crisped with less greasy feeling. My preference. 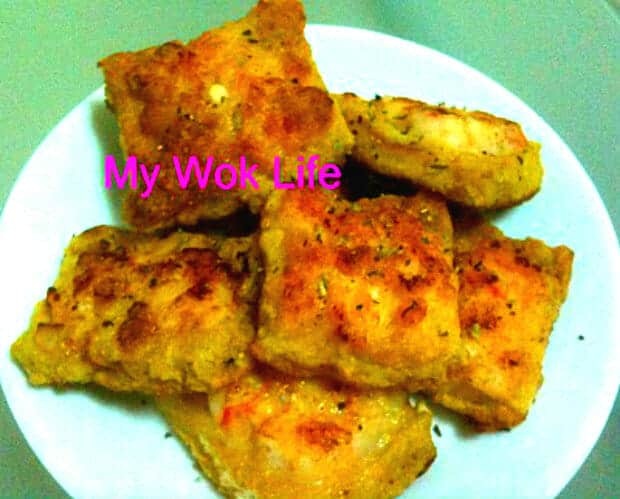 1) Extended pan-fried version: You may omit the toasting part to save minor effort, however, sauté the square only on stove over low fire for extended time, to create more crisped texture. (**Additional drizzling of cooking oil might be required for crisping.) Otherwise, simply have it with soft and moist consistency, just like the deluxe version of French toast with shrimp paste topping. Either way, it’s still excessively delicious! Tips: Since the bread is coated with egg solution, and hence, it might yield softer consistency, especially inside the bread. So, long sautéing is required to make it crisped, as mentioned previously. Alternatively, tap some corn starch on your fingers, and pat it on both sides of the bread right after coating with the egg solution. May I know what is the procedure for soaking the dry sea cucumber? Another question is where can I get a good frying wok for cooking. Which brand is good. I got mine from CK Tang but it is expensive and does not last long. I don’t like the non stick type because the layer of coating will come out. I will list the procedure in my FB later which you may refer it from once I hv done so. As for frying wok, I assumed we are talking about Chinese wok. I think CK Tang is one of those good places to buy kitchenware. I used to buy my kitchen equipment there pretty often, too, as they always offer good deals. I liked Tefal brand non stick wok. Then, I switched to a decent branded wok which I got it from a whole seller store at Paya Lebar which I hv also shared in one of my posts on such. Now, I am using ASD brand and I liked it very much. Got it from Carrerfour. Non stick wok is preferred as I think it’s easy when fry eggs or omelete.